Some time ago I had a request to connect a file with salesforce.com. The tool of choice was Oracle Service Bus, first without any special adapter. So I had to investigate into the salesforce.com way of using web services and how I can approach this challenge. 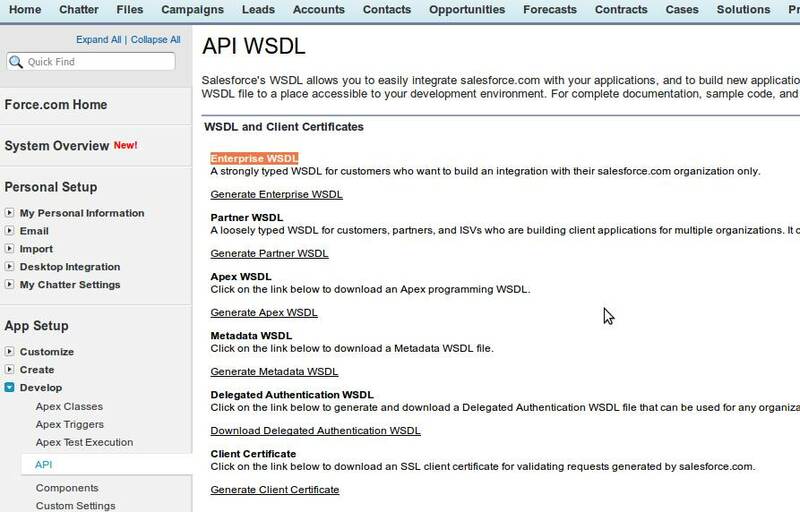 You can find more details to this here salesforce.com Documentation. 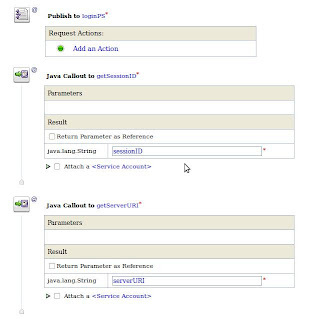 Before invoking any other calls, a client application must first invoke the login() call to establish a session with the login server, set the returned server URL as the target server for subsequent API requests, and set the returned session ID in the SOAP header to provide server authorization for subsequent API requests. 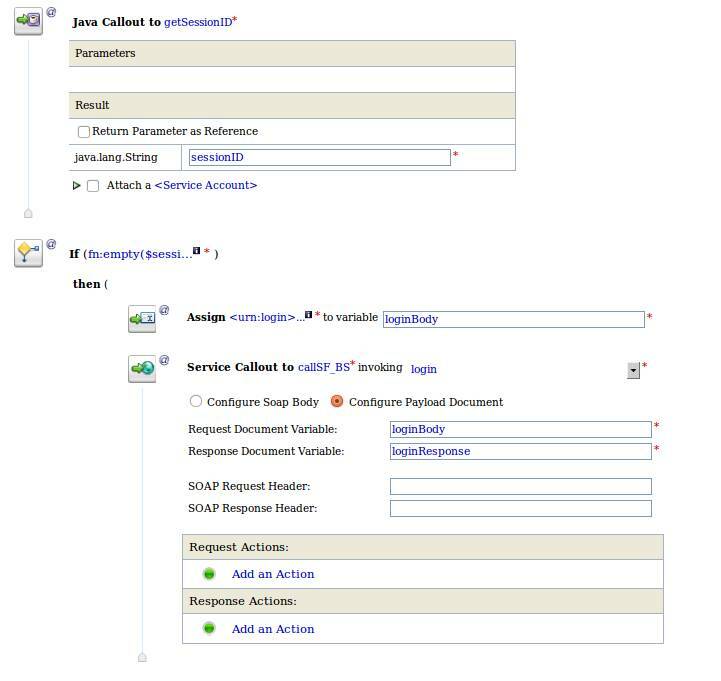 This means for Oracle Service Bus that we have to use an additional "Service Callout" before calling any other operation. With this in mind, it might be a good idea to store the session information for subsequent calls. 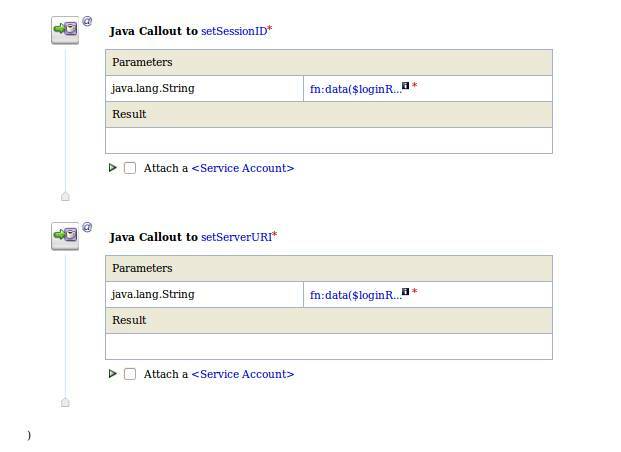 As the Oracle Service Bus is stateless, this job could be achieved by using a java callout with a class variable storing the SF session ID. I am also storing the Server URI for the subsequent calls. 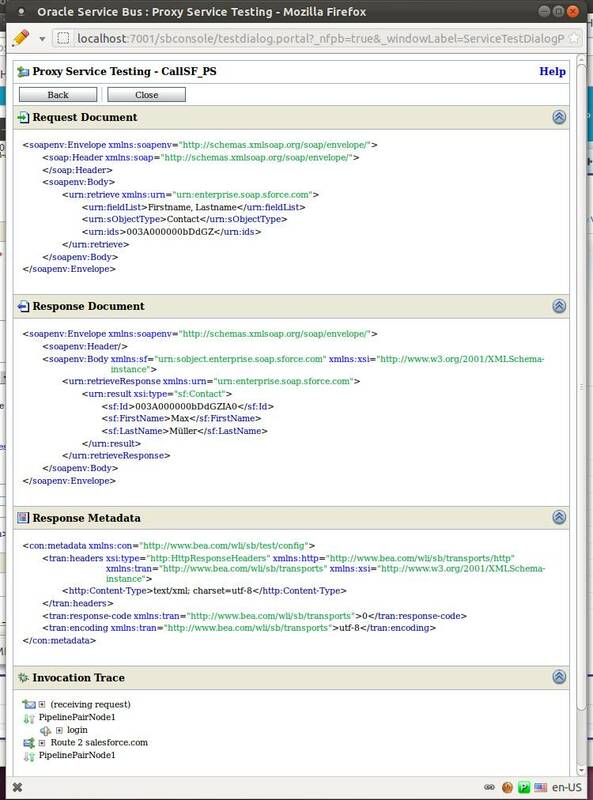 Lets have a look into a Proxy Service to Update data on salesforce.com. 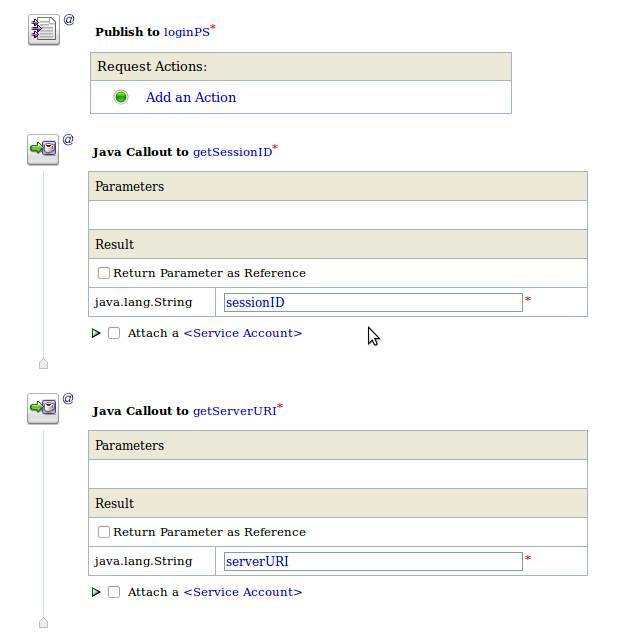 Before calling the API function we have a stage (login) with a publish action to the Login function proxy (loginPS). 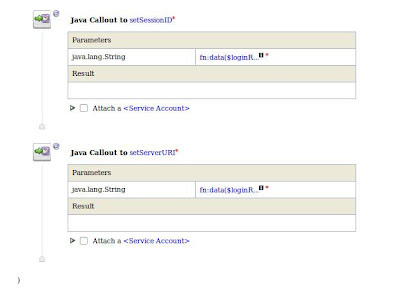 The two Java callouts read the values from the "LoginStore"into OSB variables. The LoginPS first checks if we already have a sessionID, or if it is necessary to first login and then store the results. The password consists of two parts, the password itself, here "SecretPassword" and a security token which was defined by salesforce.com and is found in the mail after user creation, or could be regenerated by changing the password, or invalidating the security token "Reset My Security Token". Than a new token is send by mail. 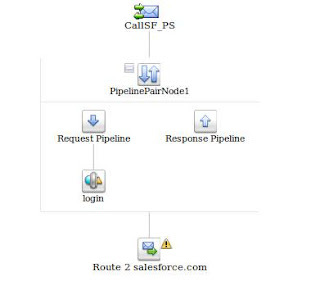 CallSF_PS in the "route 2 salesforce.com" routing node. 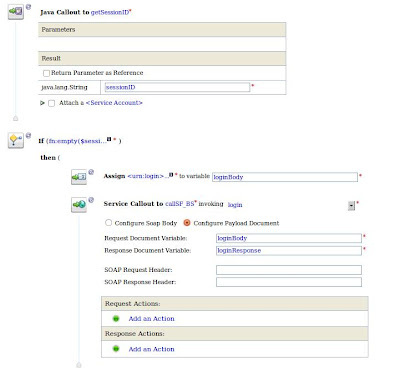 And the Routing Options action changes the Server URI to the dynamic URI returned from the login process. Finally, the service can be tested with test console. Many thanks for writing such a wonderful blog. I am having an issue while calling secured salesforce webservice. 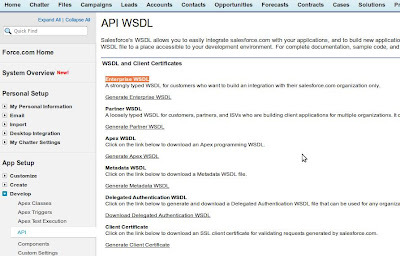 Could you please provide steps how to configure weblogic & proxy service & business service for secure salesforce web service. this is a "secured" WS call to SF. I am going to upload the complete project in the next hour. Thanks Miller, thanks for your quick response, can you through some light on the settings in weblogic server e.g. how to create a keystore in weblogic, ssl etc. 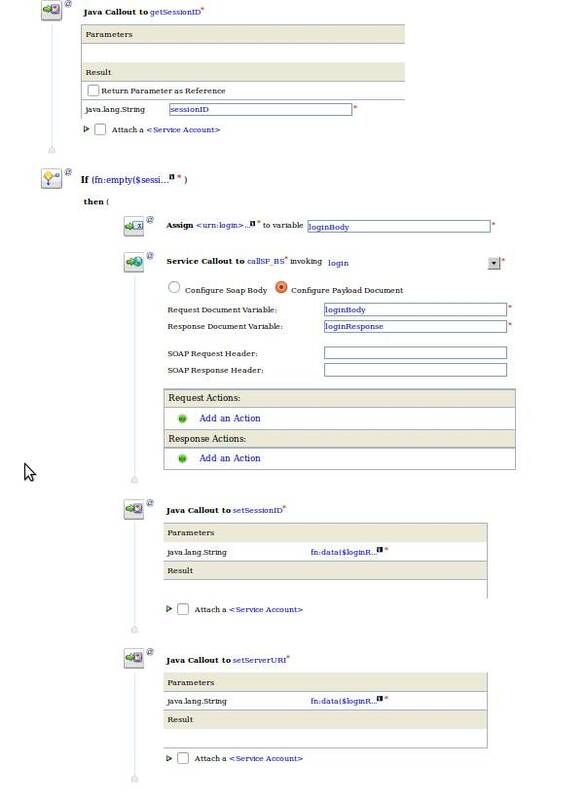 I did all that but I am getting issues while calling secured webservice of salesforce, certainly there is some issue with configuration at my end. So, if you can elaborate some steps on how to configure that. Hi, there is no special setup for the call to the secured https SF webservice. Or do you want to achieve a two-way SSL communication with SF ? Frankly speaking I dont know much about SSL, I just want to get the desired result as in your example. Also have you used any service key provider in your POC. This 11g? Cannot import into 10gR3. Yes. Import does not work. Thanks for the helpful article!!! After login, how do I invoke other Saleforce operations such as update? Excellent post on salesforce with OSB. I could use this sample and replicate in my project. Issue which I'm getting is whenever requestes are not submitted to OSBfor a while(lets say 10 hrs) ,session is getting expired but thats not cleared in the java class unless we re-start the OSB server. PLease provide your inputs on how to handle this situation. Oracle has recently released Cloud Adapter for SalesForce.com. This is the perfect way to connect OSB/BPEL to SalesForce. Many thanks for writing this nice article. Someone was asking about SSL, my salesforce interface from OSB was working good without any configuration on keystore and it started failing once I moved to "Custom" keystore from Demo keystore for some other project? Also with Demo store is Weblogic not authenticating the certificates from salesforce even though it is a https web sercvice? The invocation resulted in an error: . Can anyone give me an explanation of this error and help me to solve it? 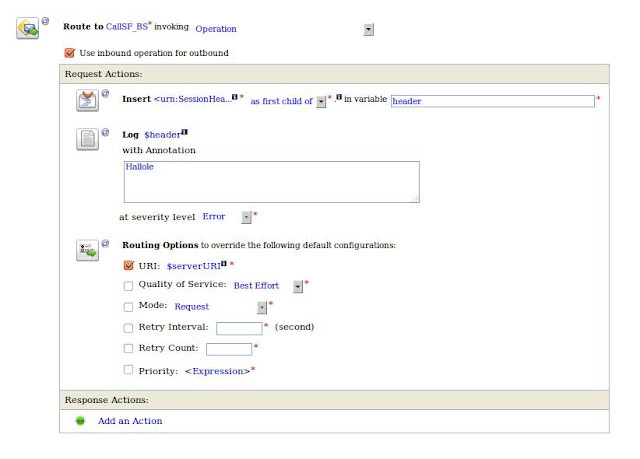 Will this works in OSB 12c or in SOA 12c ? We have to call SF as soap call, not supposed to use SF adapter. Nice Post. Could you please let us know how the session id expiration is handled here?